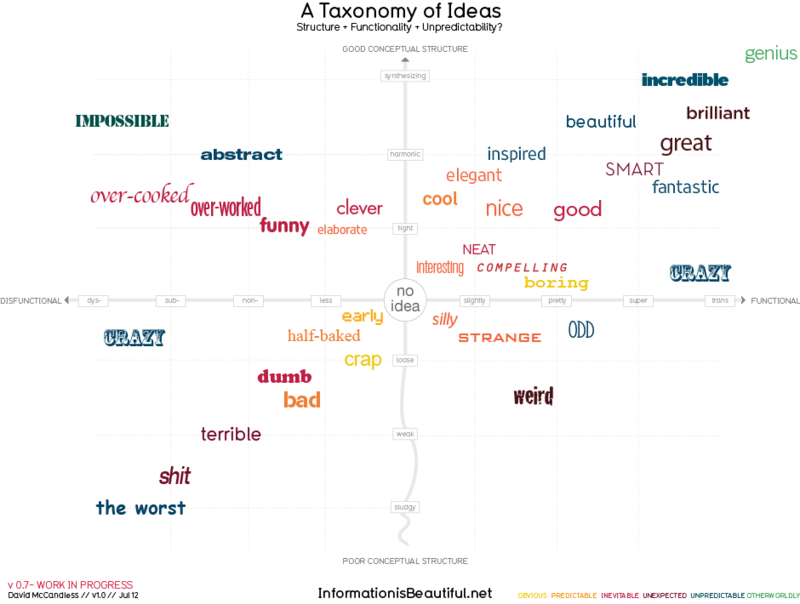 Information designer David McCandless of InformationIsBeautiful.net has created yet another interesting visualization. He has developed a first draft of “A Taxonomy of Ideas” to find out if there is “invisible language of ideas” and “unseen hierarchy hidden in that language”. Great idea! I am wondering what linguistics experts could contribute to it. For example, I am wondering if “brilliant idea” can be categorized in one way only because different people use “brilliant” in different ways at different times. McCandless addresses this in the comment section: “I guess my criteria is responses that you give as ideas are emerging live, before moral and ethical considerations kick in. When you’re just being struck by the structural quality and functional fit of a concept. Before you’ve had time to fully think it through.” But I would argue that “brilliant” already means different things to different people before they had time to think it through. He is currently inviting feedback and thoughts. I am looking forward to seeing the next iteration.